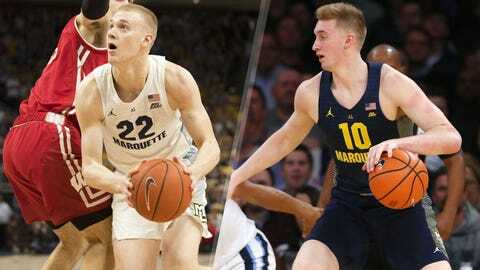 Brothers Sam and Joey Hauser announced Monday they both will transfer from Marquette at the end of the semester. This news comes just a few days after star guard Markus Howard announced his plans to return to Marquette for his senior season. Sam Hauser, who just wrapped up his junior season with the program, set career bests in 2018-19 with averages of 14.9 points and 7.2 rebounds per contest. Over his three-year stint at Marquette, the elder Hauser sunk 246 3s and logged a 44.5% clip from downtown. In his freshman season, Joey Hauser averaged 9.7 points, 5.3 rebounds and 2.4 assists in 29.2 minutes per game. He started 31 of 34 games and tallied double-digit points in 17 games.